How’s it going, forex friends? Like most of you guys, I’m waiting to see how the FOMC statement will turn out this week and how it might impact overall market sentiment. For now, I’m eyeing a potential AUD/USD swing short setup on a pullback. 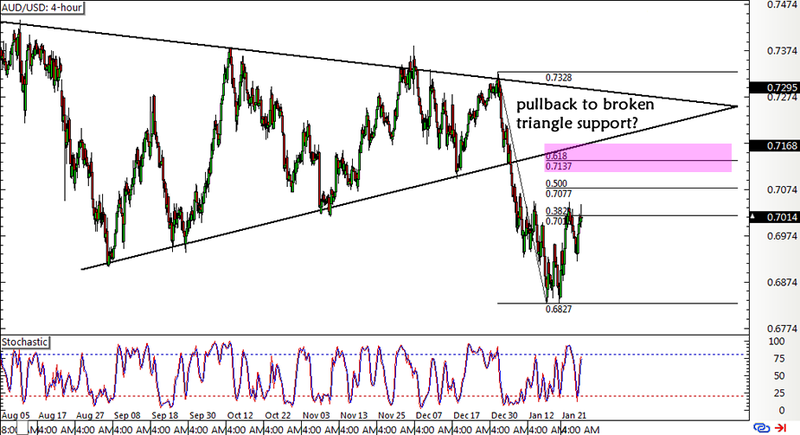 As I’ve shared in this week’s Comdoll Trading Kit, AUD/USD might be ready to retest the broken symmetrical triangle support, which is right around the 61.8% Fibonacci retracement level. I’m considering a potential short entry somewhere around .7100-.7150, depending on how this week’s events unfold. Earlier today, Australia printed a stronger than expected quarterly CPI reading of 0.4%, higher than the 0.3% consensus but lower compared to the earlier 0.5% increase. This might be enough to keep the Aussie afloat throughout the day, especially since risk appetite picked up during the European and U.S. trading sessions yesterday. However, the upcoming FOMC statement could turn things around, especially if Fed officials start dropping more hints about a potential rate hike in March. Given how financial markets have behaved so far this year, though, I’m inclined to think that policymakers might take the more cautious route and reiterate that they’d be tightening at a very gradual pace. If so, the Greenback might be in for a few more losses once forex junkies push back their Fed rate hike timeline. Aside from that, the prospect of having a longer period of relatively low borrowing costs could be encouraging for businesses and consumers, keeping risk-taking in play and taking AUD/USD up to my desired entry levels. I still believe that the longer-term Aussie selloff could resume at some point, as the slowdown in China and the fall in commodity prices could take its toll on the Australian economy sooner or later. What do you think of this trade idea? As always, I appreciate getting your feedback on my setups and don’t forget to check out our risk disclosure!